They were in our nationwide ‘Top 20’ for publicity spending, blowing a massive £4,076,000 on self promotion. They spent £3,575,000 on middle management (those on salaries of 50k or more), that’s more than 6 times what they were spending ten years ago. That they have five employees earning over £100k-per-year, with 2006/7 salaries ranging from £104,000 to £159,000. On top of this, apparently they’ve also recently spent around £800,000 on refurbishing their own offices. 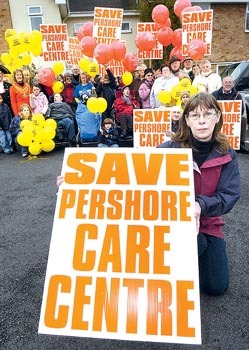 So how on earth can they justify closing a day centre for the disabled to make savings of around £85,000 per year? "This is what keeps our sons alive, my son is furious. No-one has asked him what he wants. This is about separating him from his friends, from the carers who have taken years to come to understand him and his needs. I think at best you could describe this decision as discrimination. At worst it is neglect." "We are throwing away a very valuable asset. I'm really, really distressed." it has been deemed unsustainable, and closed to make an £85k-per-year saving whilst the County Council choose to lavish money elsewhere. Once again, here we see the most vulnerable in society lose privileges and suffer, whilst local government seemingly refuses to tighten it's belt. Those at Worcestershire County Council need to reassess, and realise that the first priority for our tax pounds is to provide frontline services - particularly to those who need them most - and not to top up the pensions and salaries of local government staff.